So I finally took the plunge and signed up for a summer session of women's ice hockey. I've done three sessions so far and survived. I even scored a goal the first game! People are quite impressed when I tell them that I play ice hockey and am not talking about my son (he's starting this summer). In reality, I'm really bad, and most of the gals skate circles around me. I barely know what to do during drills, especially if it requires skating backwards, but hopefully I'll improve with time. I'm planning on signing up just for practices during the regular season at the wonderful ice time of 10:40 pm! Here's a funny story about my old helmet. 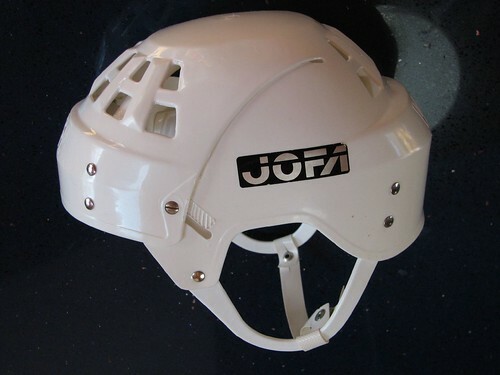 I originally bought my first hockey helmet in the early 90's back it was in fashion to have these lightweight helmets with no face shields like Wayne Gretzky. It was really cheap plastic with barely any padding and probably cost less than $20. For my latest foray into ice hockey, I bought a new hockey helmet with a face shield (on sale for $35) and decided to sell my old one on eBay. It turns out that the model I had is a collectible since it was the exact same model Wayne Gretzky used. After 24 hours, it was up to $76 and eventually sold for $200. My very first "Antiques Roadshow" moment. The money will go to Adam's equipment and at least I have a real helmet now. The other sport I started doing recently is cardio kickboxing. I was really nervous before my first class, but by the end, I was really digging it. I felt maybe I was a fighter in a previous life. So between ice hockey and kickboxing, I've really gotten into tough chick sports! Yikes.....remind me never to get into a disagreement with you!